Daimler tested its platooning technology in Japan recently. After testing the electronic connection of trucks (truck platooning) in Europe and the US, Daimler Trucks evaluated its platooning technology in Japan with its Asian brand Fuso. Part of a process that is expected to continue in Japan with an intention to arrive at a technology that is applicable in other parts of the world as well and not just in Europe and US, the platooning tests were carried out between January 23 and February 01, 2018. With a heavy-duty Fuso Super Great truck pressed into service, Daimler sought to connect it electronically in a platoon that included trucks of other Japanese commercial vehicle manufacturers. Terming the nature of connection as semi-autonomous, the platooning tests were carried out on Shin-Tomei Expressway southwest of Tokyo and on Kita-Kano Expressway, north of the Japanese capital. Initiated by the Japanese Ministry of Economy, Trade and Industry (METI), and the Ministry of Land, Infrastructure, Transport and Tourism (MLIT), the platooning tests, as part of the Japanese government’s future strategy 2017, is looked upon as an endeavour that will reduce fuel consumption and lower CO2 emissions. With an emphasis on the Internet of Things, big data and artificial intelligence across mediums, the tests also reflected on dramatic driver shortage. 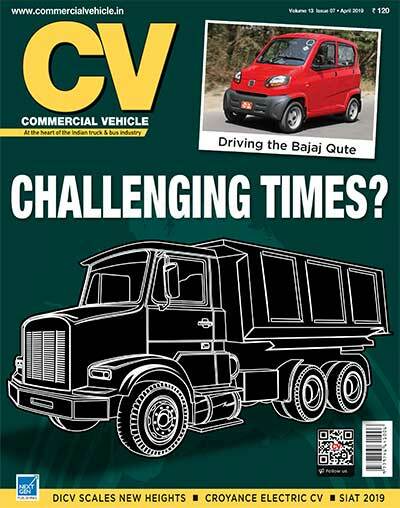 Like many countries in the world including India, there is an acute shortage of commercial vehicle drivers in Japan. Such acute is the shortage, that a new type of driving license was created at the request of the trucking industry to encourage young people to take up trucking jobs. The trucking industry is facing a big challenge amid labour shortages and an ageing workforce. Under the revised Road Traffic Law, which came into force in April 2017, a new license category for driving quasi-medium-size trucks was created for vehicles weighing 3.5 to 7.5-tonnes, including passengers and cargo. To create a space for the new truck category, the upper limit for regular trucks was lowered from 5 to 3.5-tonnes. The lower limit for medium-size trucks was lifted from 5 to 7.5-tonnes. It was the first classification change since 2007 when the category of medium-size trucks was introduced. Doing pioneering work in autonomous, connected and electric driving with its truck brands Mercedes-Benz, Freightliner and now Fuso, Daimler, the world over, has connected around 560,000 trucks to the Internet of Things. This is claimed to be more than any other manufacturer. 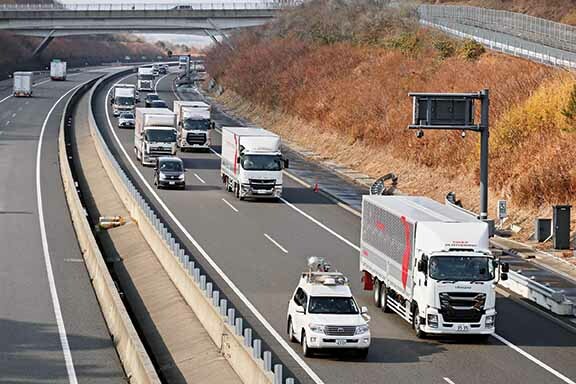 For the digital connection of the Fuso Super Great during the platooning test, Daimler Trucks combined the technological possibilities of connectivity with its experiences in the field of autonomous driving. 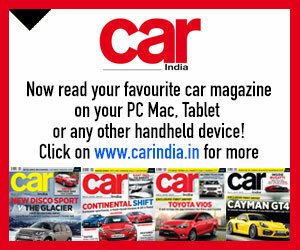 Wi-Fi-based Vehicle-to-Vehicle (V2V) was deployed and interacted with driver-assistance systems. 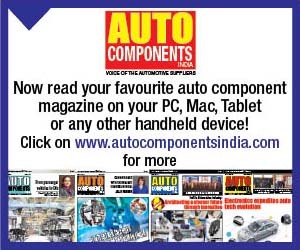 The driver-assistance systems have also found a place of pride on Mercedes-Benz and Freightliner brand of CVs. 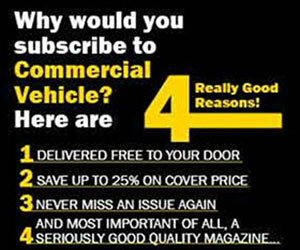 Some of those include Co-operative Adaptive Cruise Control (CACC), Lane Departure Assist and Active Brake Assist 4 (ABA 4). Expressed Martin Daum, Member of the Board of Management, Daimler AG, and responsible for Trucks and Buses, that they demonstrated with Mercedes-Benz trucks in Europe, two years ago, the platooning technology. “We demonstrated that platooning can be done and is highly advantageous. We are developing the technology with Freightliner on public roads in US. Japan too is a key market for us. 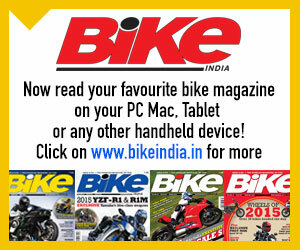 It is also a market that is looking out for and promoting new technologies. We are therefore taking part in the Japanese government’s initiative to push platooning. We want to lead the development of this technology,” mentioned Daum. 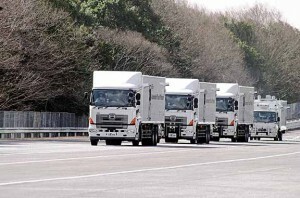 In 2013, a year before Daimler Trucks launched a concept truck called Mercedes-Benz Future Truck 2025, marking the arrival of autonomous driving functions at Daimler as far as CVs were concerned, a lineup of four large trucks circled a test track in Tsukuba City, Japan, to prove that such an arrangement was real-world. The demonstration showed that the short spacing in the caravan improved the fuel economy of the trucks by 15 per cent or more. The demonstration, like drafting Tour de France riders highlighted the fact that lower aerodynamic drag resistance results as the following vehicles in a platoon find shelter from the wind in a trailing cone of smooth air. The tests were conducted by researchers from the semi-governmental New Energy and Industrial Technology Development Organization (NEDO) working together with industrial, national lab, and academic experts. The Future Truck 25, as a Daimler’s tool to develop autonomous driving technology for series production until 2025, made a key element of the ‘Highway Pilot’ conducted by the CV major in Germany in 2014. In 2016, Daimler took part in the Dutch government’s European Truck Platooning Challenge initiative with three electronically connected and semi-autonomous driving Mercedes-Benz Actros. With the Freightliner Inspiration Truck driving in a so-called pairing-configuration (two electronically connected trucks) on public roads in Nevada and Oregon since 2017, the addition of Fuso Super Great to the fleet of autonomous experiment trucks that Daimler is running in various parts of the world, the very concept of autonomous driving is set to acquire a new dimension. 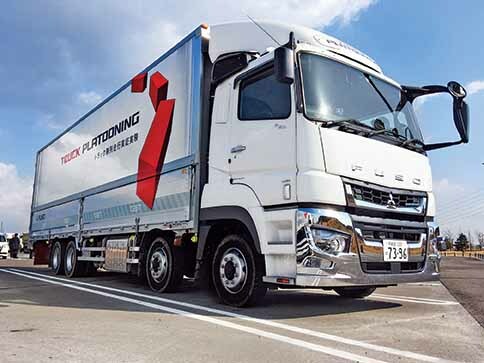 It is no less important a development that the Fuso Super Great is the first Daimler model to drive in a platoon with other trucks in the key market of Japan. The trucking industry in Japan is not only talking about technology when it comes to platooning but like in Europe and the US, is also talking about regulatory issues. Daimler Trucks customers, when the legal framework is set, will be able to operate their vehicles in platooning mode. Langstrecke im Verbund: Die digitale Vernetzung der Lkw trägt dazu bei Kraftstoff zu sparen und CO2-Emissionen zu senken.